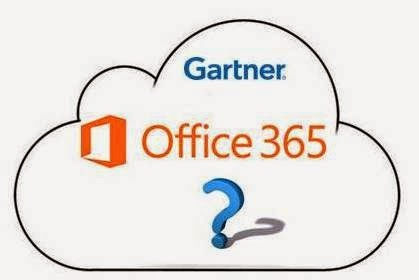 Gartner has done a recent analysis over Office 365 Adoption and also hosted a Webinar, "The Hidden Gotchas of Office 365" presented by Guy Creese,research vice president at Gartner discussing the pros and cons of Office 365 Service providing some insight on how customers react when they plan to move to Office 365 and what makes them re-think whether to adopt the service or continue with their current setup and invest more in enhancing it for their needs or to adopt any other hosting provider. When it comes to Office 365 Microsoft team is providing more enhancements rapidly as ever before if you take a look at the last few months, you would notice how many significant changes and enhancements were made to the offering which is quite a good one, on the other note, is it really useful for all the customers? whether they really need it, how will it benefit them if they don't need it and also frequent changes in the Office 365 Service make them do some investments in their On premises Environment too in terms of Client upgrades etc which is still a painful part to consider as major changes cannot be done altogether for the entire Organization which involves cost and deployment planning with user education to get in line with their latest product line used in cloud as it makes the Organizations to re-think whether to move to cloud or to stay On premises and enhance it as needed. Office 365 on the other hand does not provide all possible solutions made available like On premises there are some limitations by design and Microsoft team is working towards getting most of the workloads possible with their service, in this state on the other hand Customer environment should meet certain requirements when they need to utilize any new feature. Licensing model is not quite impressive, when it comes to customers who need to use only certain features though everything comes as bundled together they use only what they need and though its good that these additional services will be made useful when they adopt these services in mere future it is still a question and make them feel that they are paying for something which they don't need and don't use, Though Microsoft team made the Licensing flexible wherein customers can Switch plans as needed but as a customer they require a option where they themselves can select what they need and pay accordingly. Office 365 is an Extra-Ordinary service where you will get more enhanced features often that provides various benefits to your Organization and designed in a way to make it as a single solution that fits for all customers and continuously evolve along with the Technology, but as a customer its still a valid question to think whether they need to use these new enhancements now and how it will benefit their needs as each Organization's requirements varies from one another from small business to Large Enterprise customers. Also when we adopt any Cloud based service we should think about not only the cost benefits we receive and there are more important things beyond that, where the Customer experience and Support experience comes in to picture which is still question where Microsoft team needs to pay attention and make the adoption more flexible and enhance their service on these key areas which makes the real success for Office 365. Being a Office 365 Administrator for a Large Enterprise customers I was happy to receive updates over the new features brought in to the service but not all Organization is willing to test and adopt these as an when they release any significant update one after another and its still a question whether customers can keep up the speed with Office 365 service over time, All is well as long as Microsoft does not urge us to do any major changes again in another few months timeline because a huge Wave of "Wave 15" just got over and things are getting stabilized now and it will take some more time for Organization's to get ready for an other Wave and face the challenges. More detailed discussion was made available in the On demand webinar from Gartner referenced in the below Redmond Magazine post and once you review you will understand more on Office 365 Adoption and if you are one who is taking the decision for your Organization this a must watch for you to understand the service and then plan your moves to Office 365. Additionally, Read the below Network World Magazine post to know and understand the considerations before moving to Office 365 explained in a nutshell. On a Positive note I am updating the post with the some new announcements from Microsoft that can address some potential concerns that exist amongst the customers to choose Office 365 and Make them adopt the service as an add-on read. * Microsoft team is tweaking its Office 365 feature rollout and disclosure process to enhance the customer adoption and the below ZDNet post updates the same in detail, Lets give sometime and see how Microsoft team is going to address the needs and concerns of various customers through the above analysis benefiting the customers who have adopted their service offering and who are yet to adopt it over time.